Detroit, the Motor City, welcomed many newcomers to work and interact in the deaf community in the early 20th century. The booming job market attracted Benjamin and Ralph Beaver, deaf brothers from Iuka, Illinois, who helped form the Detroit Association of the Deaf (DAD) Club—celebrating its 100th anniversary in 2016. Others included the Wahowiak family, who ran a shoe repair business in Upper Michigan for two deaf generations; Arlyn Meyerson, a deaf restaurateur for 55 years; Glenn Stewart, the first black deaf man graduated from Rochester Institute of Technology; and Dudley Cutshaw, a longtime deaf local leader. In addition, Grand Rapids, Flint, and Upper Michigan each contributed to this great deaf heritage by affiliating with Detroit's deaf community. Through vintage photographs of successful organizations, including Catholic Deaf Organization, Motor City Association of the Deaf, Black Silent Club, Michigan Deaf School, and Flint Association for the Deaf, Detroit's Deaf Heritage illustrates the evolution of the deaf community and its prominent leaders. Kathleen Brockway, the deaf author, is an advocate for digital and historical preservation. DAD provided tremendous support. 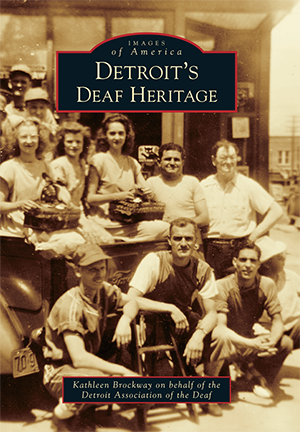 DAD and Kathleen, inspired by the stories of the deaf heritage in metro Detroit, were determined to share them in this book with the public.